I'm pleased to host Michelle Diener, author of the upcoming novel BANQUET OF LIES to the blog today, for a chat on strange occupations, knife throwing, and why chefs wear white instead of dark colors! 1. BANQUET OF LIES is set in 1812 London, a pretty busy time for the Brits. What was your inspiration for the novel's time and setting? I have always been interested in times when there was a lot of conflict, and London in 1812 was awash with it. Most of it was social conflict, but with the war with Napoleon ongoing, there was political intrigue and economic conflict as well. I used the (real) secret treaty between Sweden, England and Russia as the pivotal element of Banquet of Lies, but the social conflict that comes through is just as important to the story. 2. Who is your favorite character in BANQUET OF LIES, and why? I love my heroine, Giselle. She is resourceful and courageous. But I also love her friend, French chef Georges Bisset. He's fiery, impatient and prone to throwing knives! 3. Giselle Barrington, the heroine of the novel, is both a chef and a spy, whereas one of your previous heroines was also a chimney sweep. Where do you come up with these fabulous unique occupations? Well, there were a lot of girl chimney sweeps in the Regency period. Girls didn't grow as much as boys, so they could work in the chimneys for longer, although their masters very often pretended they were boys to their clients, as it was frowned on to use little girls as sweeps. So my heroine in The Emperor's Conspiracy came about her occupation quite legitimately. As for Giselle, her back story is having a French mother who loved cooking herself, and when Giselle tours Europe with her father, who is a folklorist (and part time spy), instead of collecting fairy tales like her father, she collects recipes. When she needs to go into hiding, becoming a cook is the natural choice for her. 4. What was the most interesting thing you learned while researching the novel? I learned a lot about Regency kitchens and in particular, about the first celebrity chef in the world, Antonin Careme. He cooked for the Prince Regent, Napoleon and the Russian czar. I found everything about him interesting. He changed the way menus were served, what was served on those menus, how kitchens were organized and introduced the white chef's hat and smock. Before, cooks and chefs wore dark colours so no one would see the spilled food. By insisting on white, Careme changed the hygiene of kitchens, as well. He was fascinating! My character, Georges Bisset, is in part based on Careme. 5. Writing a novel is a heck of a lot of work, and seeing it hit the shelves is a huge accomplishment. (And by the way, congratulations!) How did you celebrate finishing BANQUET OF LIES? I'm really bad about that kind of thing. I should celebrate more, but I've been in a situation of needing to get right on to something else when I finish a novel. So short answer, I think I took the afternoon off, but that's it. Thanks so much for joining me today, Michelle! 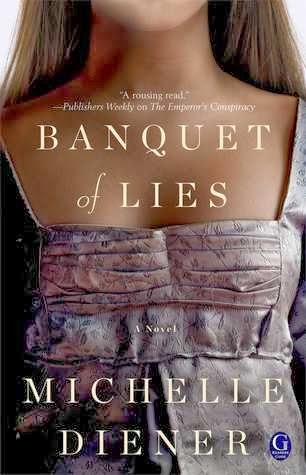 I can't wait to read BANQUET OF LIES!